The Dr. Watts 2011 Pocket Electrical Guide is UPDATED to reflect the 2011 National Electrical Code. 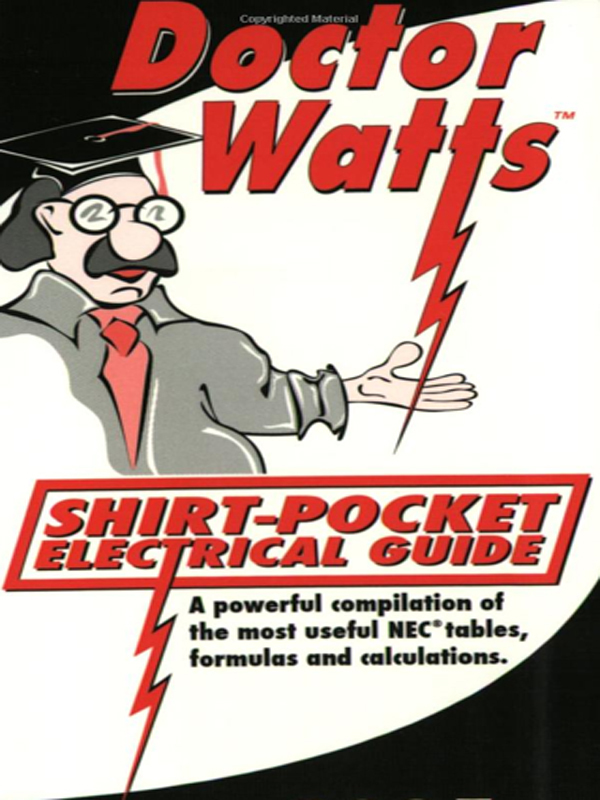 The 2011 Doctor Watts is the #1 Electrical Pocket Guide for electricians and the electrical trade. Containing the latest NEC tables, formulas, illustrations and detailed examples, this an indispensable reference for anyone working with electricity. This shirt-pocket guide is loaded with essential information for everyday reference; it’s heavy laminated pages and built-in tabs make it sturdy and durable. You can purchase the book online from Amazon at http://www.amazon.com/Watts-Pocket-Electrical-Guide-based/dp/0972629645/ref=sr_1_2?s=books&ie=UTF8&qid=1345580018&sr=1-2&keywords=dr.+Watt%27s+Electrical+guide.